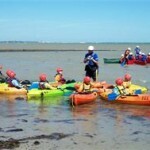 The Scout Section is for young people, usually aged between ten and a half and fourteen years old. Scouts can join the Troop at ten and may stay until they are fifteen years old, when they can join Titan Explorer Unit. The Scout Troop is the third Section in the Scout Group. Most Scouts are young people who have moved on from our Cub Packs (Cornwell or Kipling) but our Troop also welcome boys or girls who have no Scouting experience at all. If you would like to join our Troop, please contact us. 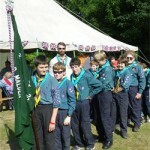 Scouts are encouraged to take part in a wide range of activities. ‘Participation’ rather than meeting set standards is the key approach and for the Scout who wants to be recognised for his or her achievements there are a number of Challenge Awards and Activity Badges. 1st Old Malden Scout Troop meet for about two hours each week. Joining Scouts is a passport to a whole new experience where young people can participate in a wide range of activities, find out about the world they live in, know their own abilities, keep fit for life and develop personal skills. Being outdoors is important and there are many opportunities to learn the traditional Scouting skills, such as camping, survival and cooking as well as the wide range of adventurous activities, anything from abseiling to yachting. Scouts in Royal Kingston District often meet together for such activities as day and night hikes, orienteering, conservation and competitive events such as swimming, camping, canoeing, cyclo cross, air rifle, archery, cooking and chess. Being a Scout is unique; there is nothing better than being with friends, as part of a team, acquiring new skills and participating fully in the adventure and opportunities of life. Take a look at the Photos from our April 2016 Camp at Boider Hurst. Please also take a look at our Troop’s microsite.